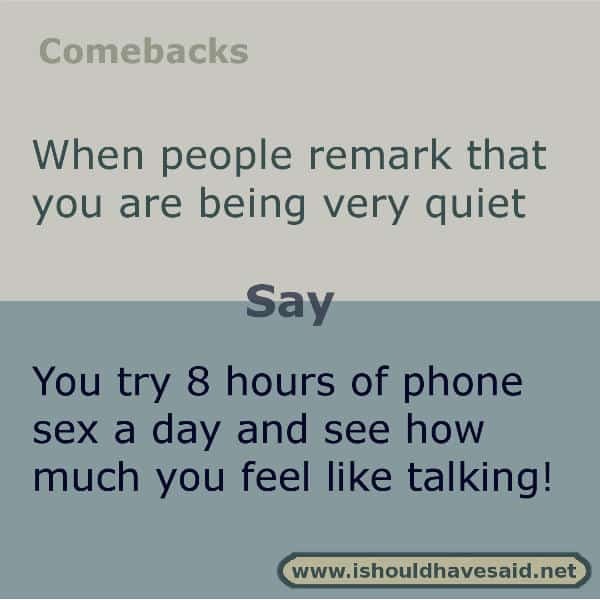 Have you ever tried to tell someone something, yet it just took a while to get your words out? You may have what you want to say on the tip or your tongue, but it isn’t coming out or your mouth or maybe you can’t remember a name. Not everyone is blessed with the ability to just talk and chat away. For some of us, it is a big deal to talk to people that we don’t know very well. 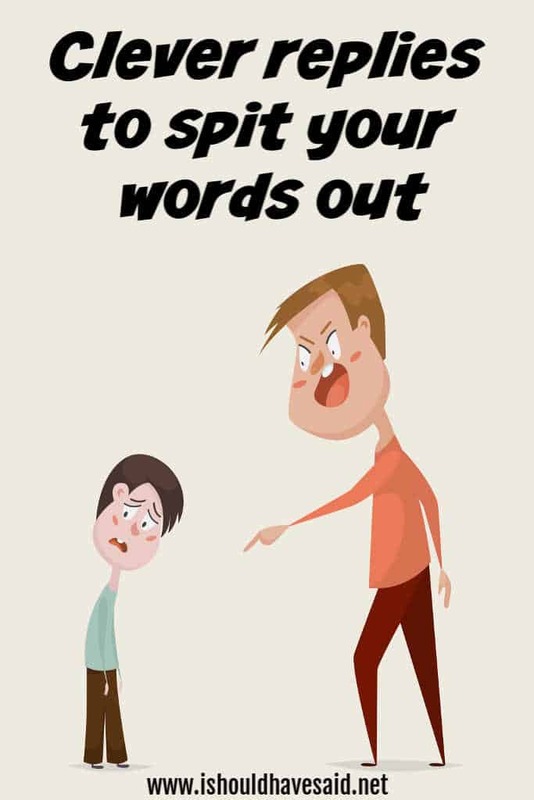 It doesn’t help when someone is yelling at you to hurry up and spit out your words. I have one friend who can’t remember certain words since having kids. The word is on the tip of her tongue, but instead, she stands there like an idiot and can’t remember what to say. 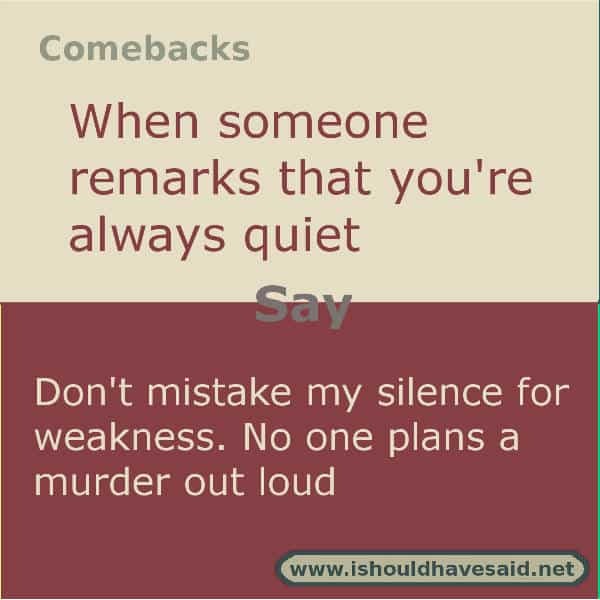 If someone keeps telling you to spit your words out, you may want to shut the person up who is constantly interrupting you with one of our clever comebacks. How can I if you keep interrupting me? I'm trying to load my thoughts, stop interfering with the process. I am so sorry, I didn’t mean to interrupt the beginning of your conversation with the middle of mine. 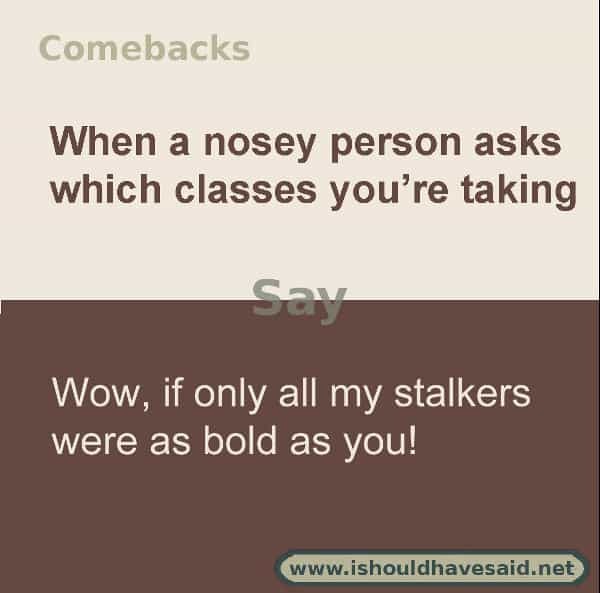 Yeah, go ahead and ask questions and interrupt every time I try to answer. When you are getting ready to go out there never seems to be enough time. 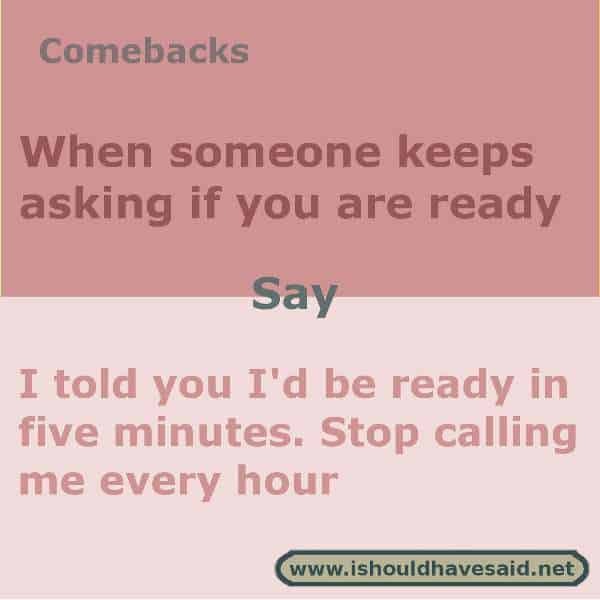 It only makes matters worse when someone keeps asking you if you are ready to go every five seconds. 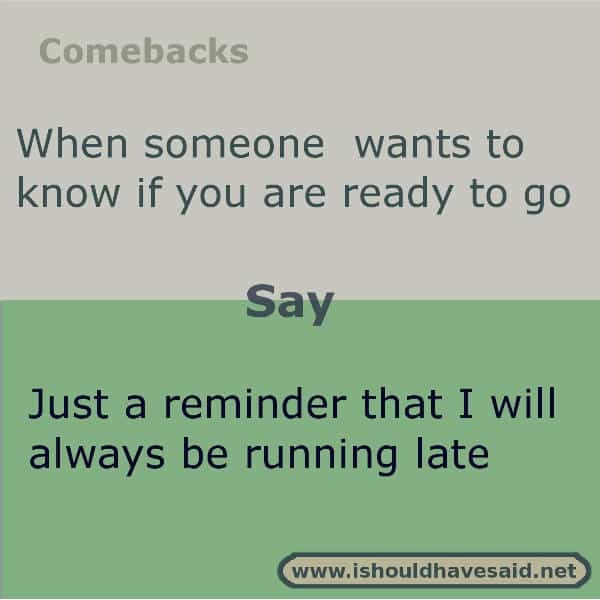 If you are tired of being asked if you are ready, use one of our fun comebacks. 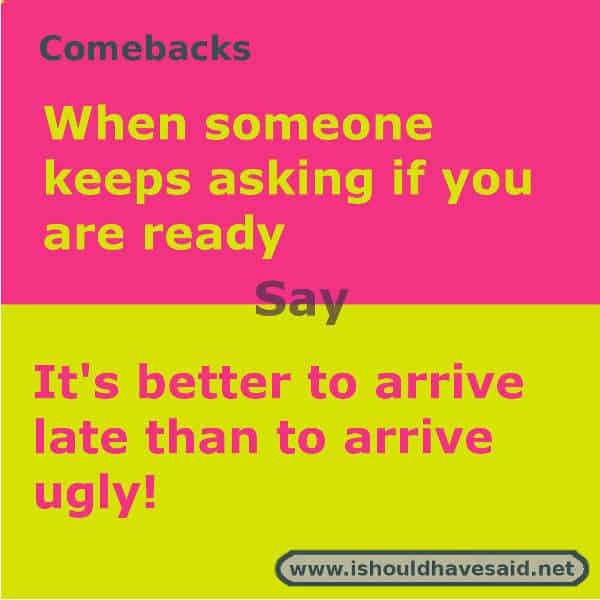 See the most popular comeback for being asked if you are ready determined by I should have said voters. When school starts one of the first things people will ask you is what classes are you taking. 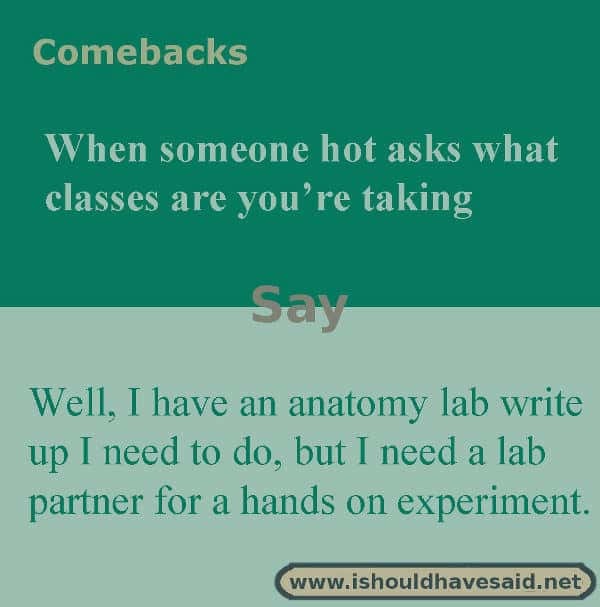 You may want to give a funny reply to someone you like or an evasive answer to someone you would prefer to avoid, try a few of our fun answers below. 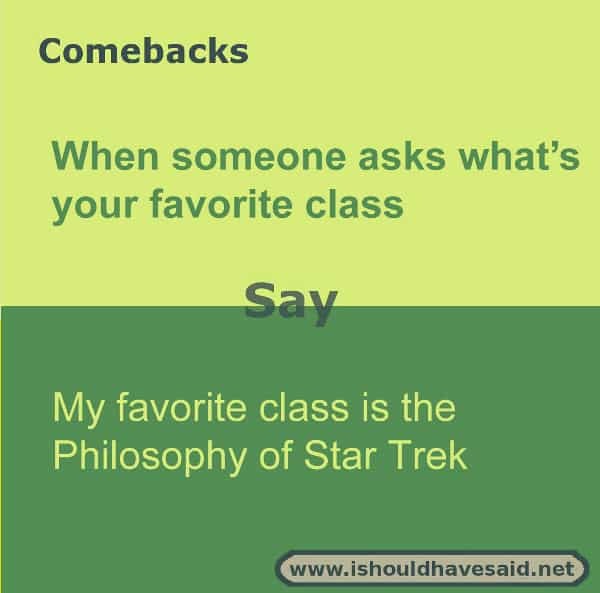 See the most popular comeback when people ask which classes you are taking determined by I should have said voters. 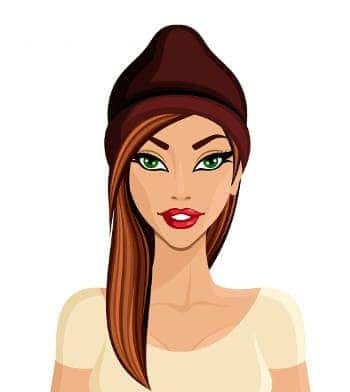 Nobody wants to be a 30-year-old virgin, and if you are you probably don’t want to talk about it too much publicly. 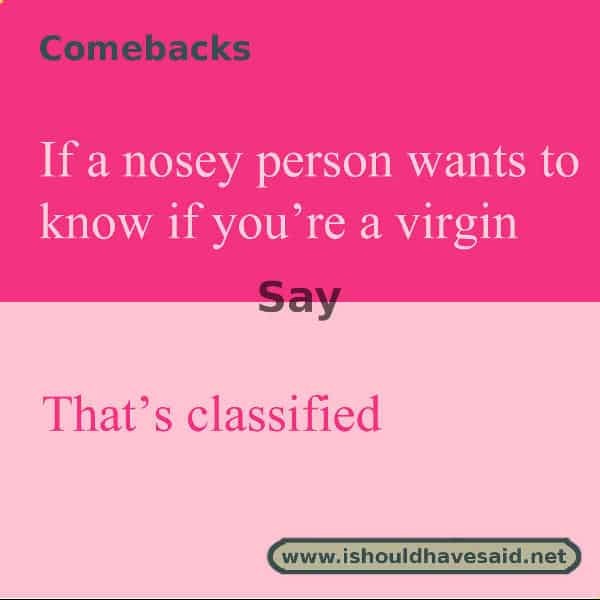 If people are being nosy about your sexual status you should tell them to get lost and mind their own business. 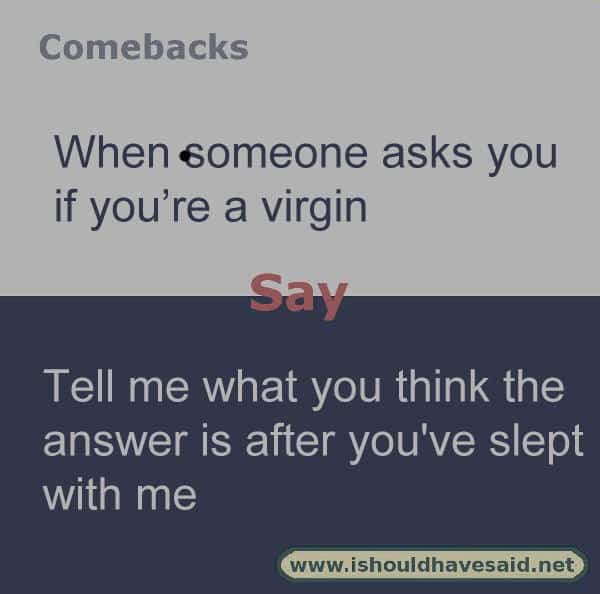 If you don’t want to share your sexual status, use one of our clever comebacks below. 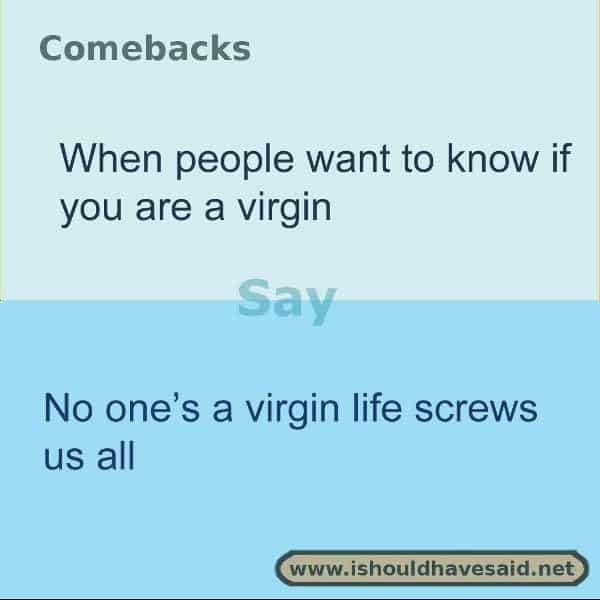 See the most popular comeback when people ask if you are a virgin, determined by I should have said voters. When you meet people for the first time do they say that you’re quiet? Not everyone wants to be the centre of a attention, some folk like to sit back and watch what’s going on in a room. 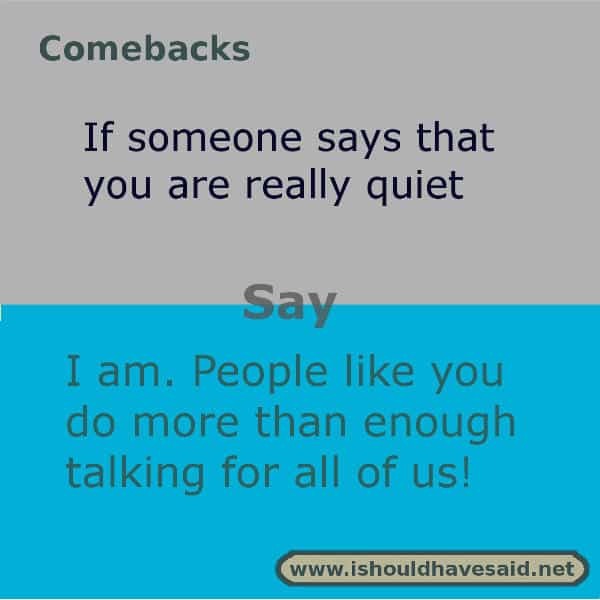 If you keep getting labeled as quiet, remember that’s not necessarily a bad thing. The people who complain that you’re quiet, are probably thinking that they are missing an opportunity to go on and on about themselves. 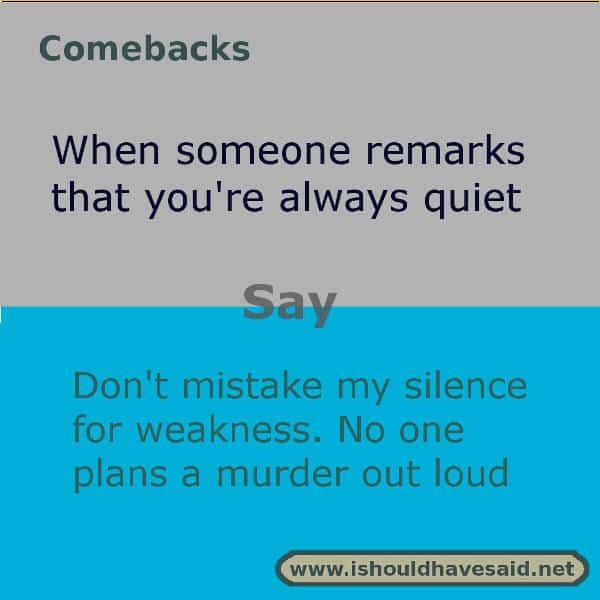 If you get tired of the quiet label, try one of our fun comebacks below. 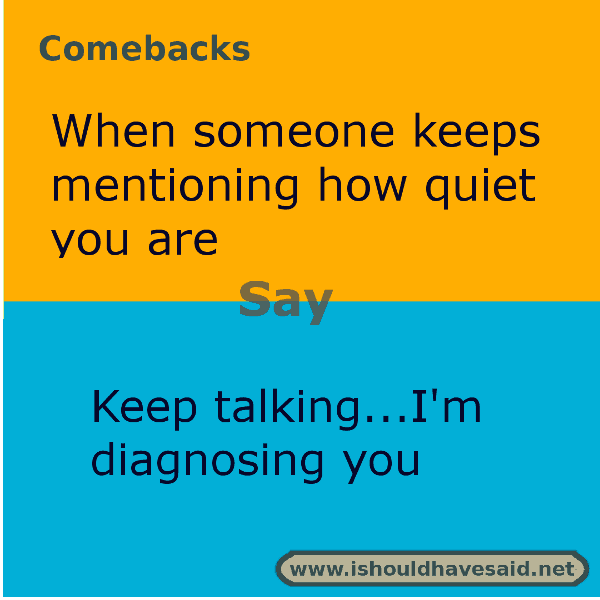 See the most popular comeback for being called quiet determined by I should have said voters.